The Homewood Suites by Hilton Denver Tech Center is Silverwest Hotels’ 10th acquisition. 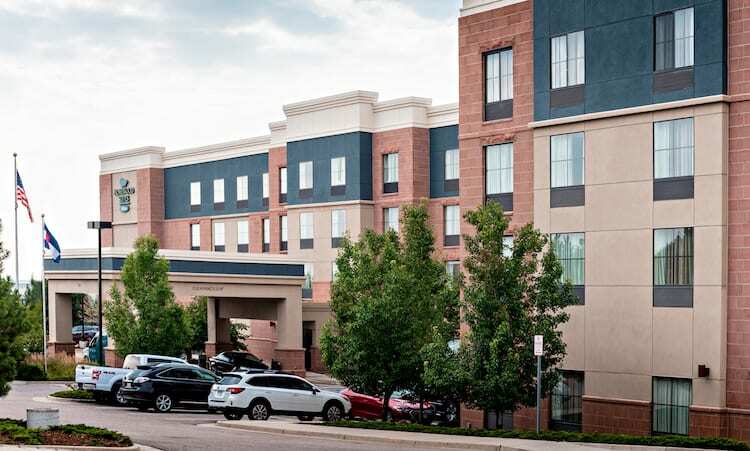 Denver-based Silverwest Hotels LLC has acquired the Homewood Suites by Hilton Denver Tech Center, which is next door to its Hilton Denver Inverness. The Homewood Suites DTC is a 113-suite property at 199 Inverness Drive West in Englewood. It is the 10th property Silverwest has acquired since its founding in 2013 and its fifth Hilton-affiliated hotel. “We’re very pleased to be acquiring the Homewood DTC hotel and adding it to our growing portfolio of hotels and destinations,” said Charlie Peck, Silverwest co-founder and chief operating officer. “We believe that southeast Denver is the best location and growth area in suburban Denver with its exceptional business, residential and recreational facilities,” he said. The price wasn’t released, but public records state Arapahoe Hospitality LLC sold the hotel for $18.7 million, or $165,486 per key. Silverwest plans to undertake a renovation of the hotel in 2019. Guest and event reservations will not be affected. “Silverwest will invest capital to bring the hotel up to current brand standards,” said Patrick Mace, Silverwest managing director, acquisitions and development. Major improvements to the guest rooms will include an updated design, new mattresses, renovated bathrooms, stainless steel appliances for kitchens and new televisions, he said. Silverwest also will renovate guest room corridors, the lobby, pantry, meeting room and fitness center. Homewood Suites is a leading brand in the select-service/ extended-stay category with 431 hotels in operation in 2017 and 34 additional properties projected to open this year. The Homewood Suites DTC includes studio, one- and two-bedroom suites with kitchens, a heated saltwater pool, sports court, meeting space, a 24-hour business center and complimentary hot breakfast. Silverwest acquired the adjacent Inverness Hotel and Conference Center in 2015 and completed an extensive renovation, converting it to the Hilton Denver Inverness. The two hotels will work together to offer a wide range of accommodations and services to guests, including Hilton Honors members staying at either property. Silverwest Hotels is an investment and management company that owns and manages hotels in Colorado, Texas, Iowa, Missouri and Hawaii.